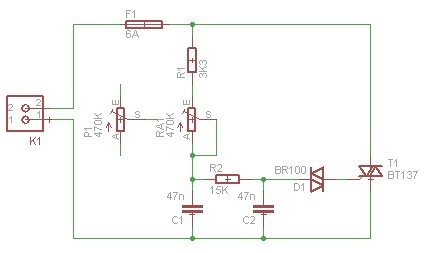 This is the Light Dimmer circuit for 230V I first built back in 1991. 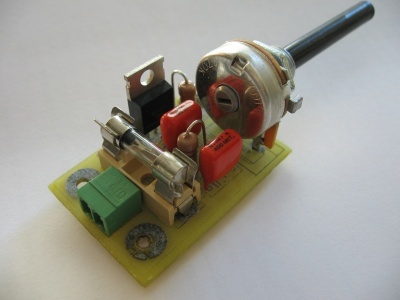 It's a quite powerful circuit capable of driving lamps up 1800W and still very simple to build. 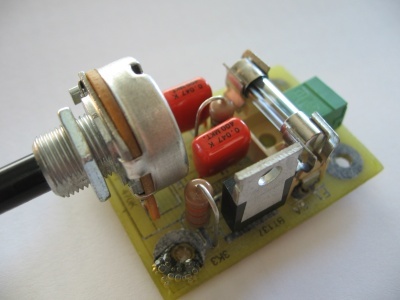 It's made to be used as a replacement for a wall switch or as the basic element for an analog light organ. The circuit contains only 8 components and connects directly to the 230V utility network. It works by controlling the phase of the 230V sinusoidal wave on which the triac fires. This controls the amount of power delivered to the lamp and thus its brightness. Increasing P1 or RA1 will charge C1 slower, the triac will be triggered later and the brightness diminishes. Decreasing P1 or RA1 will charge C1 faster, fire the triac sooner and increase the brightness. R1 defines the maximum brightness (minimum delay). R2 and C2 filter instabilities at low brightness. 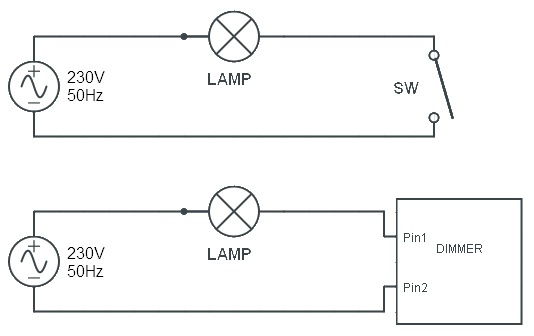 D1 diac provides a clean trigger for the triac gate when the voltage in C2 reaches 30V. The PCB is very compact and uses only through-hole components. P1 and RA1 represent the same component but with different footprints. They can be populated with an angular potentiometer, a vertical adjustable resistor or a sliding potentiometer (using wires). 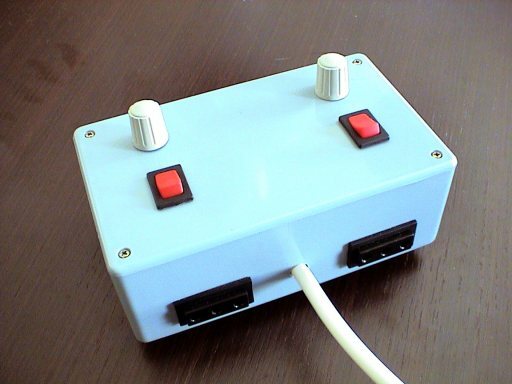 The board was designed to be easy to replace an existing ligth switch. It connects in series with the light bulb like any light switch. To replace a light switch, remove it from its box inside the wall and connect both wires to the dimmer. Don't forget to disconnect the power first! This is the final result with two PCB placed inside the box. Demonstration video of two instances if this circuit inside a box.